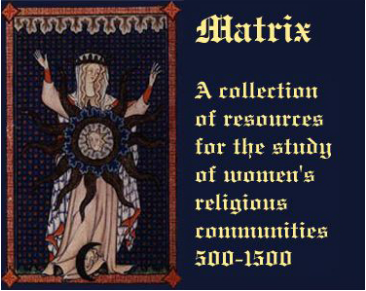 Monastic Matrix, como lo declara su título, es una fuente académica para el estudio de las comunidades femeninas religiosas (A scholarly resource for the study of women’s religious communities from 400 to 1600 CE) que abarca la Edad Media y la era moderna. Se trata, como lo declaran sus creadores del Departamento de Historia de la Universidad Estatal de Ohio, de un esfuerzo colaborativo de distintas disciplinas para el estudio de la cristiandad femenina. El acceso a fuentes primarias (Vitae) y secundarias va de la mano con iconografía, léxico y una importante bibliografía. Monastic Matrix is an ongoing collaborative effort by an international group of scholars of medieval history, religion, history of art, archaeology, religion, and other disciplines, as well as librarians and experts in computer technology. Our goal is to document the participation of Christian women in the religion and society of medieval Europe. In particular, we aim to collect and make available all existing data about Christian religious women in Europe between 400 and 1600 C.E. The project draws on both textual and material sources, primary and secondary, although its basis is unpublished archival evidence. It addresses a variety of individuals and groups in medieval Europe, and a range of ecclesiastical institutions, including monastic houses of every size, affiliation, and rule. Our editorial intentions in selecting and presenting material are both scholarly and pedagogical. Matrix is designed for use by scholars, students, and anyone interested in the study of women, medieval Europe, or the history of Christianity. Monastic Matrix can be used to study the histories of communities or individuals, consulted as a library of documents and images related to women’s communities, or as a reference guide, or the project can be searched as a database.